The 3-day course includes three full days of learning how to use our versatile line of decorative paints, lime plasters and concrete products. This course teaches you the latest in decorative finishes to keep up with a constantly changing creative industry. Included in the price of the class is a $250 gift card for all Meoded paint and plaster products, redeemable after the class. Working with the latest trends in the faux business will help you develop new clients and business opportunities. By the end of this course, you will leave with a beautiful portfolio containing between 15-20 stunning finishes made by you! The intensive training will give you the expertise to duplicate each finish on your customer’s home. This will allow you to show an actual live finished sample to your customer on the spot. Not only will your skillset increase, but this will help you sell instantaneously. During the 3-day course, you will get the chance to work with 5 different lime plasters, 4 different decorative paints, and concrete finish plaster. Working with 10 different products ranging from Venetian plasters, to metallic paint, and glitter paint, you will widen your portfolio and proficiency in all the trending decorative finishes. As part of this course, you will complete the full curriculum which consists of 12 mandatory samples including every Meoded product. In addition to these 12 samples, every individual will get the chance to walk around our 5,000 sq.ft showroom and choose 6-8 samples of their choice that they want to master! At the end of the course, everyone will receive a certification for completing Meoded’s professional paint and plaster training course. We as professionals will take you as our VIP customer after the class and support you throughout the year with new products, refer you to jobs, and get you out to the market! 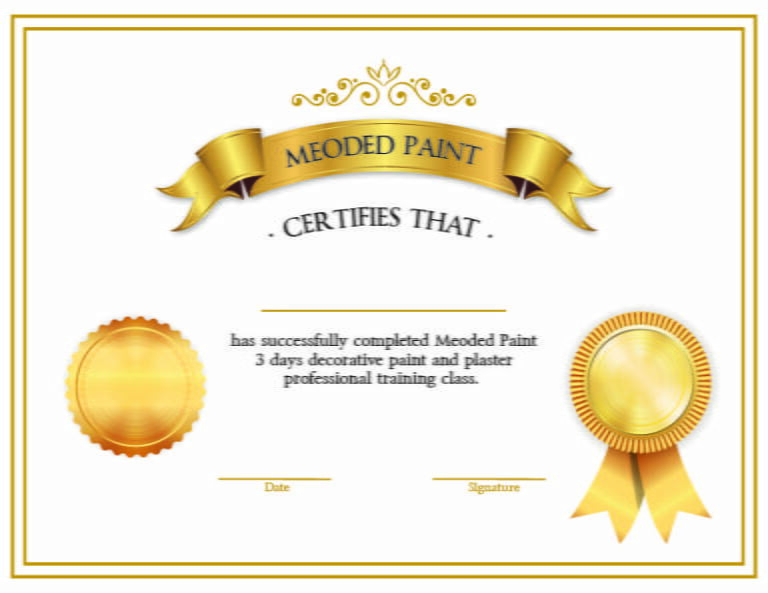 Become an expert in the decorative paint and plaster industry with Meoded’s training! Gift Card: $250 Meoded gift card redeemable after course!